Even as an adult, I love building sand castles. Having spent a big chunk of my life in Florida, I’ve built a lot, probably more than 100. Now, this doesn’t exactly count as a profound revelation. Of course my sand castles didn’t survive. 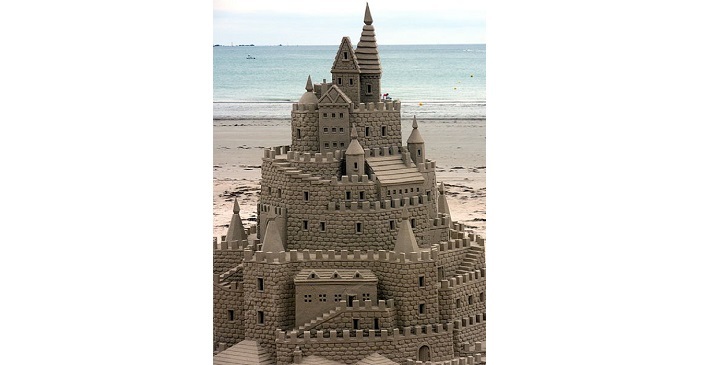 I built them out of sand. They lacked any real substance. Wind, waves and rain made quick work of them. This compares nicely to the political views held by a vast number of Americans. I spend a lot of time engaging others in political discussions, and one thing I find over and over again: very few people can articulate a coherent political philosophy. Don’t get me wrong. They have plenty of opinions and points of view on various policy issues. They can vehemently argue whether the government should continue this or that program, or whether the U.S. should or should not intervene in a given foreign country. But it seems nothing holds all of their viewpoints together. I find no visible common thread running through their various policy preferences. Most Americans articulate a hodge-podge of disconnected and contextually incoherent opinions. I blame this primarily on the left right paradigm in the country. Most Americans follow the lead of their party. Republicans espouse Republican viewpoints, and Democrats parrot Democratic viewpoints. Beyond self-identifying as a “liberal,” or a “conservative,” it seems the vast majority of Americans haven’t really consciously developed a true political ideology. In fact, the terms liberal and conservative have lost any real meaning. They words exist simply as labels to identify on which side of the political aisle individuals stand. In other words, these terms help people determine what policy they should support or oppose, but they do not really define an actual political philosophy. Obviously, I’m generalizing here, but hundreds, if not thousands of discussions, both in person and on social media, lead me to this conclusion. But just because one cannot articulate a political philosophy and explain the underlying moral/ethical paradigm that supports it, doesn’t mean they don’t have one. In fact, most of these people do operate out of a coherent philosophical outlook – they just do it unconsciously. And interestingly, it appears to me most Americans share the same philosophical/moral/ethical framework, whether liberal, conservative or somewhere in between. It roots itself in utilitarianism, pragmatism and consequentialism. Ultimately, Americans judge policy on whether or not they believe it advances the common good as they define it. Generally, the ends justify the means. Of course, we find a wide divergence of opinion about what exactly constitutes the “common good.” Debate in American politics tends to center around that. The left sees it one way, the right sees it another. But both agree on the way to get there. You should find this disturbing, because the underlying philosophical/moral/ethical worldview driving politics in the U.S. serves as the foundation for totalitarianism. In his classic work, The Road to Serfdom, Friedrich Hayek reveals how the populations of western Europe, and to a lesser degree the U.S., were embracing the same underlying philosophy found in Germany prior to the rise of Nazism and in Russia prior to full-fledged communism. I see these same strains in American thinking today. And most don’t even realize it. In The Road to Serfdom, Hayek quotes extensively from E.H. Carr, pointing out how the esteemed British professor parroted thinking underlying the rise of Nazism. A realist, he (Professor E.H. Carr) explains, is one “who makes morality a function of politics” and who “cannot logically accept any standard of value save that of fact.” This “realism” is contrasted, in truly German fashion, with the “utopian” thought dating from the eighteenth century “which was essentially individualist in that it made the human conscience the final court of appeal.” But the old morals with their “abstract general principles” must disappear because “the empiricist treats the concrete case on its individual merits.” In other words, nothing but expediency matters, and we are even assured that “the rule pacta sunt servanda (agreements must be kept) is not a moral principle.” That without abstract general principles merit becomes solely a matter of arbitrary opinion. Government must use force to mold the world into the majority’s vision of the “common good.” My job is to convince enough people to see it my way. I call it the road to totalitarianism.